Boordy Vineyards in Hydes, Maryland, was the first entrant into Maryland’s modern wine culture. Established in 1945, it reinvigorated an industry that officially has been around since 1648. Tenis Palee is the first Marylander on record to have produced wine. In 1662, Governor Charles Calvert introduced European grapes to Maryland, planting some 200 acres. Since the Maryland Wineries Association began keeping statistics in 2001, the local wine industry has enjoyed remarkable growth. In 2001, the state produced 438,866 bottles, valued at $6.14 million. A little over a decade later, in 2013, Maryland producers corked 1.74 million bottles, worth some $26.1 million in sales. Maryland now has about 120 acres of soil dedicated to wine cultivation. The roughly 80 Maryland wine producers comprise a majority of total grape producers. (Annual grape yield averages 800 tons.) Vineyards turn out 420 different types of wine each year. 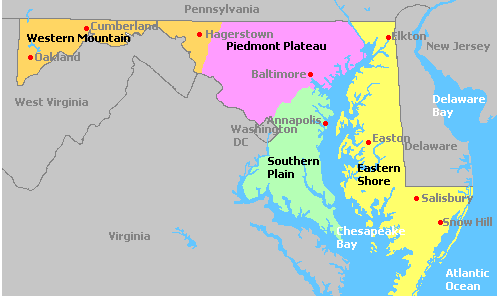 Overall, Maryland shares the same latitude (39° N) as many classic wine regions, including Spain and Southern Italy. Still, proximity to water, relative altitude, and type of soil can have a dramatic result on the end product. Central Maryland’s Piedmont Plateau features a majority of the state’s vineyards, including its oldest vineyards. The region runs from just east of Hagerstown to the head of the Chesapeake, running northwest and southeast of Baltimore.To visit the best wineries in Piedmont Plateau, follow the Piedmont Wine Trail. The Eastern Shore, one of the fastest growing Maryland wine regions, enjoys warm days and cool nights. Like all coastal wine regions, it experiences fewer temperature variations, as the Chesapeake Bay has a natural stabilizing effect. A coastal location also makes for somewhat sandy soils. 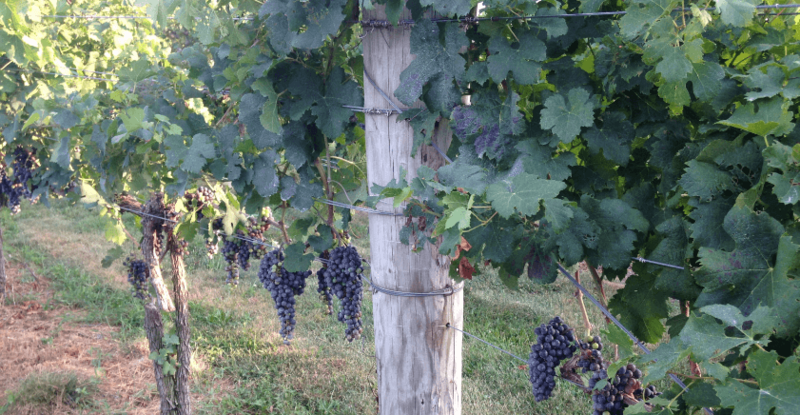 Beginning south of Baltimore, the Southern Plain region is known for its consistent heat, which favors the production of a number of classic Italian varietals, like Sangiovese, the primary grape in wines from the Chianti region of Italy. (Europe names wines by region; the Americas, Australia, and South Africa name wines by grape.) Lesser-known grapes, such as Barbera, have also thrived in the coastal climate. Not surprisingly, the Western Mountains are a far cooler growing region. This supports only the hardiest of grapes, like Cabernet Sauvignon and Chardonnay. More than two dozen wine grapes are grown in Maryland, a diversity made possible by regional climate variances. Both white and red grapes are grown, with many well-known varietals such as pinot gris and syrah found across Maryland vineyards. Perhaps unlike wineries in neighboring states, Maryland has an abundance of Italian varietals that have adapted well from Piedmont and other famed Italian wine regions. Rohrersville, MD 21779 301-302-8032 M: 11:00 a.m.–5:00 p.m.
Funkstown , MD 21734 240-675-0845 M: 2:00 p.m.–7:00 p.m.
Hydes, MD 21082 410-592-5015 M: 10:00 a.m.–5:00 p.m.
Chestertown, MD 21620 410-925-6181 M: 11:30 a.m.–5:00 p.m.
Thurmont , MD 21788 240-449-0677 M: 10:00 a.m.–3:00 p.m.
Kennedyville, MD 21645 302-304-0551 M: 12:00 p.m.–5:00 p.m.
Hydes, MD 21082 443-253-9802 M: 12:00 p.m.–5:00 p.m. Rising Sun, MD 21911 410-658-8388 M: 11:00 a.m.–6:00 p.m.
Pylesville, MD 21132 410-879-4007 M: 10:00 a.m.–5:00 p.m.
Owings, MD 20736 410-286-9463 M: 11:00 a.m.–5:00 p.m.
Silver Spring, MD 20904 301-651-1495 M: 11:00 a.m.–6:00 p.m.
Forest Hill, MD 21050 443-495-1699 M: 11:00 a.m.–5:00 p.m.
Clear Spring , MD 21722 301-842-2777 M: 12:00 p.m.–5:00 p.m.
Vienna, MD 21869 410-228-1205 M: 11:00 a.m.–5:00 p.m.
Olney, MD 20832 301-570-1907 M: 11:00 a.m.–9:00 p.m.
St. Michaels, MD 21663 410-745-0808 M: 12:00 p.m.–6:00 p.m.
Dickerson, MD 20842 301-605-0130 M: 12:00 p.m.–6:00 p.m.
Tu: 11:00 a.m.–2:00 p.m., 5:00 p.m.–10:00 p.m.
W: 11:00 a.m.–2:00 p.m., 5:00 p.m.–10:00 p.m.
Tr: 11:00 a.m.–2:00 p.m., 5:00 p.m.–10:00 p.m.
F: 11:00 a.m.–2:00 p.m., 5:00 p.m.–11:00 p.m.